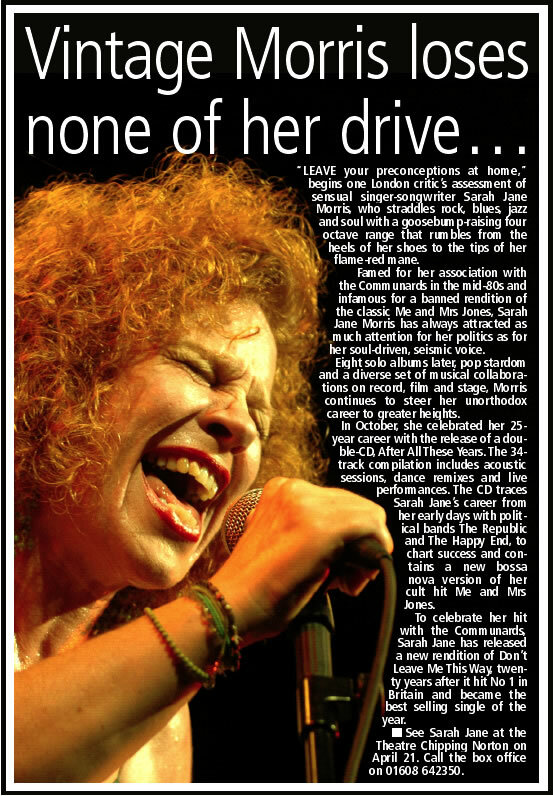 When Sarah Jane Morris sings the blues you're dealt dirty, honest, raw emotions. So much so, if you close your eyes you could almost imagine you're in the presence of one of those earthy early blues stars: a Ma Rainey perhaps or a Bessie Smith. Morris taps into a musical legacy, passed down via the gravel-voiced shrieks of Janis Joplin. Like Joplin's, hers is a cracked, yet astonishingly deep voice, which doesn't shy away from emotional taboos. Between songs she appears sweet, gentle, you might almost say... like a girl. Yet when a chord strikes up and she opens her mouth, it's a mature woman, sullied by life and tainted by experience, who sings. In songs like Mad Woman Blues and It's Jesus I Love (but the devil I need tonight), she sounds and acts like a woman 'on the edge'. The band's musicianship is professional and flawless providing a funky, yet smooth-edged, backing for Morris' somewhat gritty uncultivated vocals (think: Nina Simone meets Janis Joplin and you'll be half way there). It's been four years since we last saw her at the Plough. The set list hasn't changed that much but it's great to hear her cathartic songs which sound like they've been honed in anguish and drenched in tears. Let's hope we don't have to wait another four years for this unique blues singer to return.